On a hill, high above the Hudson River is Olana – a historic home and 250-acre landscape that boasts majestic views of the Hudson River Valley, Catskill Mountains, and Taconic Range. Built in 1872, the site was once home to landscape painter Frederic Church – a central figure in the Hudson River School of American landscape painters. Its aesthetic was influenced by his travels to the Middle East. Although Church originally hailed from Hartford, CT, he came to the Hudson Valley area to study under painter Thomas Cole – founder of the Hudson River School. In 1845, he became acquainted with the sprawling property that is now Olana while sketching there. Recognized as one of America’s most prominent painters, Church is renowned for capturing the golden glow of the sunsets and the dramatic mountain scenes that the Hudson Valley area is renowned for. Church achieved professional success while in his early 30s and used his creativity to exhibit his highly detailed works in a rather theatrical manner. He once charged guests twenty-five cents for admission to view his “great picture,” The Heart of the Andes. His artwork endured and remained relevant to American collectors at a time when they were increasingly gravitating toward European art. In 1860, a few months before marrying Isabel Carnes, Church purchased a 126-acre farm. A country cottage known as “Cosy Cottage” was the first addition to the property, which Church and his new bride referred to as “The Farm.” Although Church worked with architect Richard Morris Hunt on the home’s design, he worked solely on the planning of the picturesque gardens and orchards. He also planted trees, dredged a lake, which provided a water source for plumbing, and built an art studio. After the loss of the Church’s first two children – a son and daughter – the couple retreated to Jamaica for several months and then to Vermont. In 1867 they acquired more land and planned to build another home, which became the main house. After an 18-month trip to Europe and the Middle East, Church hired architect and landscape designer Calvert Vaux to work on the design of the main house. Construction began in 1870. The duo envisioned a stately home that would incorporate Middle Eastern elements and designs. Vaux, who also designed the buildings in Central Park, had close personal ties to the Church family. It’s believed that he was responsible for the structural elements while Church designed ornamental elements of the home. Olana’s architecture reflects a fusion of Victorian elements and Middle Eastern decorative motifs. The stately villa boasts an asymmetrical massing of towers and block masonry. It is punctuated by fanciful windows and porches. The exterior and interior are intricately stenciled with designs that Church created, which were based on his adoration of patterns illustrated in Les Artes Arabes by Jules Bourgoin – a book in his collection. The motifs on the exterior were also created out of colored brick, wood, slate, and ceramic tile. The rooms of the main home are arranged around a central hall. The downstairs level boasts a foyer, east parlor, court hall, sitting room, corridor, library, pantry, dining room, and studio wing. Church designed the studio wing, which was completed in 1890. One of the largest rooms in the house, it is significant for its size, function, and symbolic value. Church’s bedroom is upstairs along with a dressing room and landing. The Ombra Room and Evelyn and Maurice Sharp Gallery are also located upstairs. Thousands of objects and painted décor evoke the great civilizations of the past, and present a rich contrast to the natural world, which is visible through the windows. Eclectic furnishings hail from Church’s extended trip abroad while others were purchased in New York City or obtained through a missionary in Persia. The interior remains much as it was during Church’s lifetime, exotically furnished and embellished with objects from his global travels. The house has approximately 40 paintings by Church and his friends. Interesting furnishings include a carved teak fireplace by Lockwood de Forest; Chinese-style scrolled back chairs that were originally upholstered in blue silk velvet (c. 1890); and Cashmere India Chairs, designed by Lockwood de Forest and made of painted teak and upholstery (1881-84). Another item of interest is the Charter Oak Chair, which is believed to be constructed from tree branches and roots that hail from a famous Charter Oak tree in Hartford, CT. The story of the oak dates back to 1687. Sir Edmund Andros – the English-appointed governor of New England journeyed to Hartford to take possession of the charter for the colony of Connecticut, which detailed the rights and privileges of the colony. According to legend, during negotiations, the lights went out and when they were restored, the charter was missing. Hidden in the hollow of an oak tree, this document became a symbol of determination for independence. In 1846 Church chose the iconic tree as the subject of his painting, The Charter Oak, Hartford, which remains at Olana. In 1856, the tree blew down and Church visited Hartford and secured portions of the wood. Part of the tree was gifted to the American Museum of Natural History, but two other sections of it remain at Olana. Furniture and smaller commemorative items were crafted from pieces of this oak. They include a chair and a letter opener, both still at Olana. 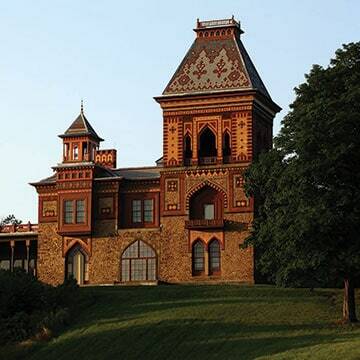 Notable guests of Olana include Mark Twain and railroad tycoon William H. Osborn among others. Former First Lady Jacqueline Kennedy and former Governor Nelson Rockefeller both had a hand in preservation efforts of Olana, which was designated a National Historic Landmark in 1965. The Olana Partnership has been working with contemporary artists for years, but collaborated with the Thomas Cole National Historic Site in 2015 with the inaugural contemporary art exhibition, “River Crossings: Contemporary Art Comes Home.” Since then, Olana’s team has invited contemporary artists to react to and be in conversation with Frederic Church and Olana. Olana’s sprawling landscape is open daily, year-round from 8am to sunset. There is no admission fee to access the landscape, which is used for leisurely walks, dog-walking, cross country skiing, snowshoeing, and beyond. Visit olana.org for the tour schedule. Construction is currently underway for the Hudson River Skywalk, which is scheduled to be completed by Spring 2019. The Hudson River Skywalk will provide a continuous walking path from the Thomas Cole National Historic Site over the Hudson River via the Rip Van Winkle Bridge to the Olana State Historic Site.